Premium quality, individually-handled, consistent with MS-67 grade. 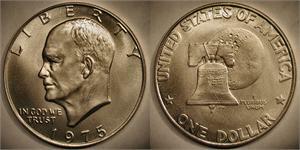 The US Mint produced Eisenhower Dollars from 1971 to 1978. Although Frank Gasparro prepared a galvano model dated "1970", no coins with "1970" or "1975" dates were ever produced. Now available is this modern over-strike, the most exacting and faithful rendition available. Holding one in hand gives the viewer a true sense of what it would be like to own an original (had any actually been produced). And since these are over-struck on genuine coins, they have the correct weight (no metal is added or removed), correct metallic content, and correct diameter and edge type. All the over-strikes are privately and painstakingly performed using a surplus Denver Mint coin press. 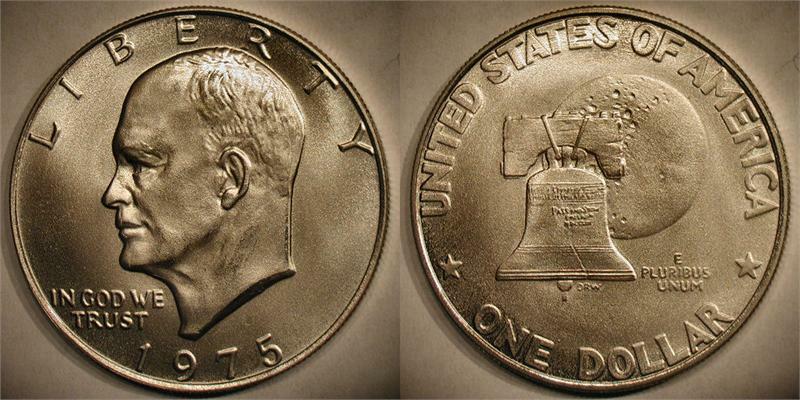 NOTE: Defacing of US coins is legal so long as the defacement isn't for fraudulent purposes. By purchasing one or more of these, the buyer agrees to provide full disclosure of their origin when reselling them. Failure to provide potential buyers with complete and accurate information when offering these could result in criminal and/or civil fraud charges. In other words, don't try to sell to unaware buyers as original coins of this date. Since these are over-struck on existing coins, there may be faint evidence of the original coin design showing since the over-strike is usually not perfectly aligned with the original strike. Do not attempt to use these as legal tender. This product is NOT endorsed or approved by the US Mint, US Treasury, or US Government.